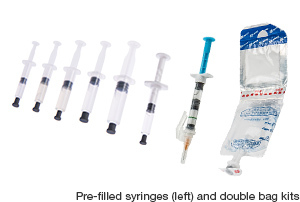 Producing pre-filled syringes, double chamber bags （PLW®）, and other kits for injectables in general, is one of the greatest strengths of Nipro Pharma. Thorough containment measures have been taken for highly reactive agents including anticancer drugs, antibiotics, and steroids that are showing high market growth. Measures such as constructing separate buildings for each type of drug are taken. 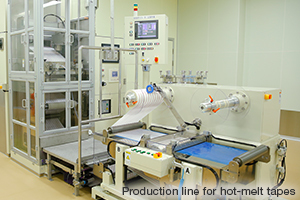 For external preparations, we introduced a cutting-edge production line for solvent type tapes, thoroughly ensuring a quality assurance system capable of meeting the GMPs requirements in Europe, Japan and the United States. 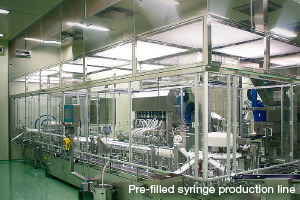 At this plant, we produce pre-filled syringes （PFS®）, i.e., syringes pre-filled with drug solution, double chamber bags （PLW®）providing drug solutions combined with dissolving solutions, as well as kit preparations including double chamber pre-filled syringes, involving the application of double chamber bags to syringes, thereby contributing to improved sterility assurance, the prevention of medical mistakes and efficiency in medical settings. For antibiotics, anticancer drugs, steroids, hormone drugs and other highly reactive agents, GMP requires containment measures to prevent cross contamination between drugs. 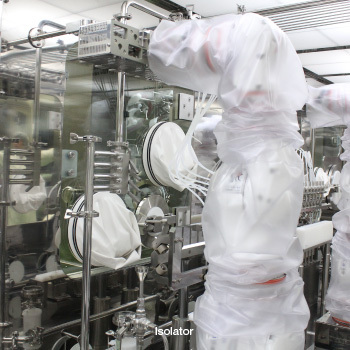 Nipro Pharma has built separate production buildings for injectable highly reactive agents, and has taken other measures for enhancing safety and quality, including installation of isolators inside such buildings to prevent contamination. We also produce biomedicines and anticancer drugs in response to the increasing production requests from customer companies. 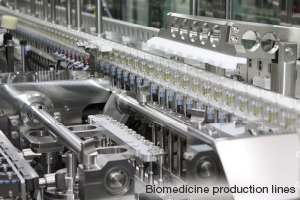 We have introduced preparation, filtering, and filling processes with high yield rates into the biomedicine production lines, so that the loss of high-cost raw materials will be minimized. 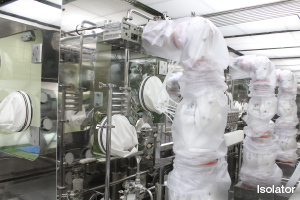 In the anticancer drug production building, where intensified safety measures are required, we use five robots inside the isolator to achieve full automation. We also make suggestions concerning countermeasures against bottle breakage, so that damage to glass containers will be minimized. 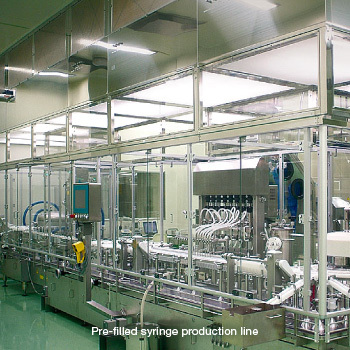 Here, we have a variety of different equipment to produce high-quality pharmaceutical products. 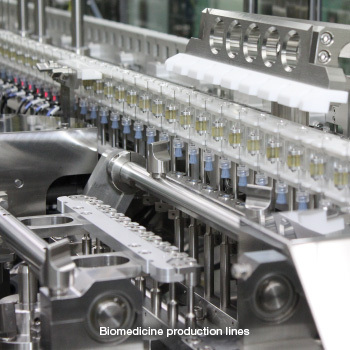 On the pre-filled syringe production line, we have established an aseptic operation combined with quality assurance, based on integrated production through to the final packaging. 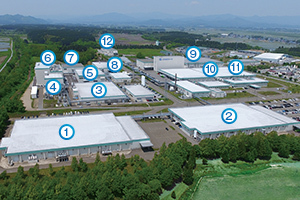 The production lines for API are also equipped with refining facilities to produce high-quality pharmaceutical products. 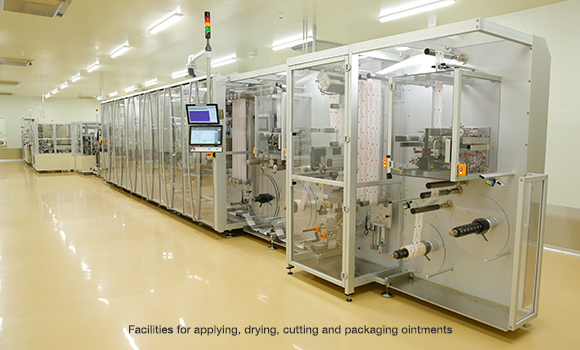 This plant is able to produce tapes of constant quality based on our rigorous production control and highly-advanced production technologies employed in preparations of drug solutions, application of ointments and packaging. We also ensure a quality assurance system capable of meeting the GMPs requirements in Europe, Japan and the United States. This plant is also able to produce oral disintegration films.